Heat oven to 350º F. (175º C). In 5 or 6-quart Dutch oven, melt butter over medium heat. Add celery, onion and green pepper; cook 10 minutes or until vegetables are tender, stirring frequently. Add garlic, thyme, nutmeg, and ground red pepper; cook 1 minute, stirring. Add uncooked rice, shrimp, clam juice, salt, bay leaf, and 3 cups water; heat to boiling over high heat. 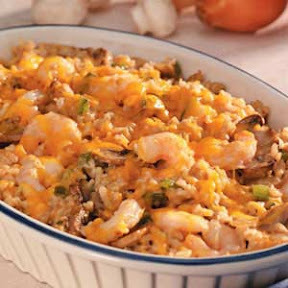 Cover and bake 30 minutes or until liquid is absorbed and rice is tender. To serve, discard bay leaf. Top with sliced tomatoes. Nutritional Info Per Serving: 150 cal, 9 g pro, 22 g carb, 2 g total fat; 1 g fiber, 52 mg chol, 325 mg sod.